The National Institutes of Health (NIH), the primary agency in the U.S. responsible for biomedical and health-related research, has awarded University of Tennessee faculty Steven Ripp, PhD, research associate professor in the UT Center for Environmental Biotechnology, and Stacy Stephenson, MD, assistant professor and director of the UT Graduate School of Medicine Laboratory of Regenerative Medicine, a Small Business Innovation Research grant for a study to improve the tracking of cells used in regenerative medicine, a relatively new field of research. Regenerative medicine is a form of translational research, which means the study starts in a laboratory setting with the potential to be used in patient care. Regenerative medicine involves stimulating the body's own repair mechanisms using cells to functionally heal damaged tissues or organs. Current estimates show that approximately one in three Americans could benefit from regenerative medicine, with applications to leukemia, Type 1 diabetes, cardiovascular diseases, neurodegenerative diseases, brain injuries and other traumatic injuries. Bone marrow transplants are one of the most commonly known regenerative therapies in medicine, commonly used to treat leukemia, lymphoma, multiple myeloma and immune deficiency disorders. The study is in response to an NIH request for new techniques for non-invasive, long-term tracking of cell survivability, engraftment and migration following implantation. Assessing the fate of cells implanted into the body will allow for improved treatment effectiveness and an enhanced understanding of the potential risks of regenerative therapies. The approach to following implanted cells is similar to how fireflies light up. A chemical reaction called bioluminescence creates light production in fireflies. This process occurs in specialized light-emitting organs, usually a firefly's lower abdomen. When mixed with oxygen, an enzyme known as luciferase causes the organ to light up. By equipping the regenerative cells with the ability to constantly glow, the cells' health and location can be tracked non-invasively. The project involves creating a lentiviral delivery vector. Viral vectors are commonly used to deliver genetic materials into cells, and lentivirus is a type of virus that permanently integrates the genetic material into a cell's DNA so that it may be expressed constantly and passed down as the cell divides. The project is expected to be completed by June 2016. In fiscal year 2015, NIH's small business programs invested over $780 million into early-stage health and life-science companies that are creating a wide range of innovative technologies to align with NIH's mission to improve health and save lives. 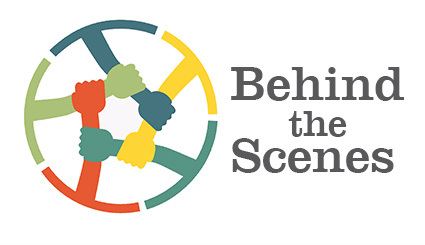 Through internal research, NIH is the largest biomedical research institution in the world, and externally it provides more than $25 billion in research annually. Research through NIH funding is extremely competitive. 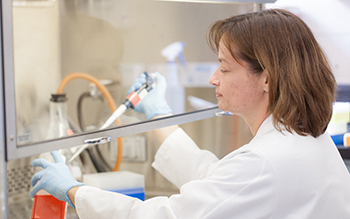 Currently the UT Graduate School of Medicine has four research projects funded through NIH grants. 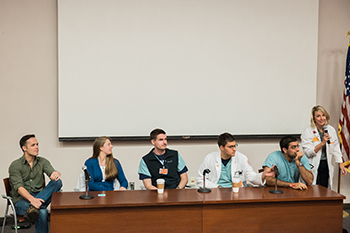 UT College of Medicine students in their third and fourth years of medical school participated in a panel discussion, answering questions by UT Knoxville "Intro to Health Care" students, a class led by Kimberly Morris, MD, FACP, Associate Professor, Medicine. The discussion focused on applying to medical school and what medical school is really like. On the panel were Jeff Atherton (M4), Katie Thurman (M4), Allan Hamilton (M4), Ben Pomy (M3) and Vikas Suri (M4). The panel members agreed that important factors for getting into medical school are grade point average, MCAT scores, and extracurricular activities. They did suggest that while biochemistry and gross anatomy are important undergraduate classes to take, taking classes students will enjoy is also valuable because once in medical school, the curriculum is the same for everyone. The medical students also suggested volunteering at a hospital, getting involved in a research project, and getting involved in organizations that interest them and taking on a leadership role. Atherton said he received positive feedback during interviews for initiating a swing dance club. Hamilton said, "You can't do lots of fun activities during medical school, so do it now." He noted that his admission panel made positive comments about his experiences with track and Young Life. However, Pomy said, "Try to do something because you want to, not just to look good on applications." In regards to life in medical school, the panel members agreed that it can be difficult to create or maintain a school/life balance because you have to study a majority of the time, but they did offer some suggestions. Several student commented that maintaining relationships with people who are not in medical school is especially difficult because they don't understand what you are going through and you can't do everything you'd like to do together. However, Pomy said that he created a system where he would study for six days and then he would take a day off to spend time with non-medical school friends, rest, and "not go crazy." He said, "It's difficult, but possible." Thurman noted that keeping up with her non-medical school peers can also be difficult because they are graduating from school and getting started on their careers, which allows them to do things like save money in a 401K that she is not able to do yet. Undergraduate students were interested in knowing about debt related to medical school. Several of the medical school students noted that since you can't pay on the loans while you are in school or residency, the debt is something you have to not think about. Undergraduate students also asked about MCAT preparation. Several students said you need at least three months to prepare. Hamilton said, "The MCAT is unlike any other exam in college. Answering the questions prepared me for what tests are like in medical school." Thurman said, "It was big for me to practice the test ... it's a long test, something to get used to for medical school." When asked if they would choose medical school in hindsight, all of the students said yes. UT undergraduate students gave positive feedback on the discussion. One student said she liked that they were getting advice from students currently in medical school as opposed to doctors who were in medical school 10 or more years ago. Subimal Datta, PhD, Professor of Anesthesiology and Professor of Psychology at the UT College of Arts and Sciences, received the 2015 B. K. Anand Oration Award at the All India Institute of Medical Sciences in Asari Nagar, New Delhi. The international award is given annually to an eminent basic medical scientist with special contributions related to neurosciences. The award was first given in 2004 and is named for Dr. B. K. Anand, an eminent neurophysiologist who established the Department of Physiology at AIIMS and made significant contributions to the field of physiology. The award is given to eminent Indian or foreign scientists for outstanding basic science or clinical contributions to the field. Dr. Datta's oration was, "Gift of Sleep and Dreaming: A Cellular and Molecular Mechanism for Converting Today's Experience into Tomorrow's Memories." Dr. Datta is recognized as one of the world's leading experts on the neurobiology of sleep and cognitive neuroscience. He joined Anesthesiology's neuroscience research team in January 2015. Current research led by Dr. Datta aims to understand disorders such as insomnia, addiction, depression, and different types of anxiety disorders (including PTSD). Understanding the cellular, neurochemical, and molecular mechanisms underlying regulation of REM sleep and processing of different types of memory, including emotional memory, during different stages of sleep and wakefulness have been the main focuses of Dr. Datta's research to date. 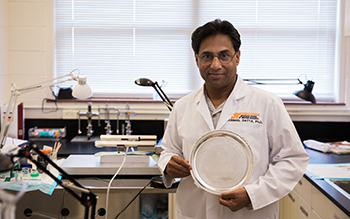 Dr. Datta's research is currently funded by a grant from the National Institutes of Health totaling $1,385,000. His work has been continuously funded by NIH research grants since 1995. Prior to joining the UT Graduate School of Medicine, Dr. Datta was Professor in the Departments of Psychiatry and Neurology, the Director of Sleep and Cognitive Neuroscience Research laboratories, and an Associate Director of Clinical Sleep Medicine Fellowship Training program in Boston University School of Medicine. Dr. Datta earned his doctorate degree in human physiology and neuroscience from AIIMS and completed postdoctoral training in Neurophysiology at Laval University School of Medicine and at Harvard Medical School. The Urology Residency program at the UT Graduate School of Medicine has been approved by the Accreditation Council for Graduate Medical Education for two additional residency positions for a total of eight residents each year in the four-year program. Since its inception in 2003, Urology has had six resident positions, alternating one to two categorical positions each year. Beginning in 2017, each first-year class will have two residency positions available. The program also received continued accreditation from ACGME. The Mission Statement for the Program is to produce urologists with notable medical knowledge and extraordinary surgical skills; individuals who are leaders in the community and the field of urology. To develop compassionate, unselfish professionals interested in the care of and service to their patients and to thoroughly educate resident urologists in the seven competencies and encourage them to treat, comfort, teach, and improve their minds as part of a life-long learning process. To reach this goal, all residents will participate in clinical research as well as have extensive experience with both inpatient and outpatient evaluation and management of urologic patients with proper supervision. 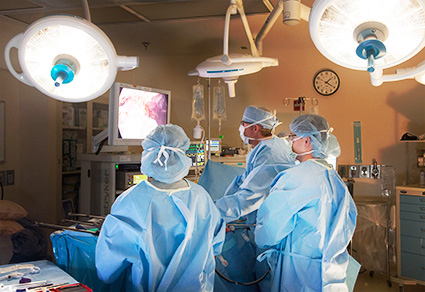 One pre-urology year must be completed in the UT Graduate School of Medicine Surgery program. The general surgery rotations include trauma, general surgery, surgical oncology, pediatric surgery, ICU, and vascular surgery. The Urology Residency program is directed by W. Bedford Waters, MD, who is a Trustee Emeritus of the American Board of Urology, Inc., serving as its president from 2008 to 2009, secretary-treasurer, chairman of the executive committee, chairman of the finance committee, and chairman of the recertification committee during his tenure on the ABU from 2003 to 2012. Dr. Waters is also a member of the American Association of Genito-Urinary Surgeons and a new member of University Health System, Inc. Board of Directors. "Restoring testosterone production in men better than replacing it"
"Estrogen Modulator Boosts T in Hypogonadal Men, Trial Finds"
"Pre-op Anesthetic Eases Post-op Pain, Cuts Hospital Stay of Hernia Patients"
"UT Medical Center Hosts COPD Screenings"
"Tenn. gets 'D' on premature births"
"UT Medical Center helping people understand health care"
"University of Tennessee Medical Center First to Adopt Siemens PET/CT Software"
"Cancer disparities rooted in 'health inequity'"
"Atrial fibrillation: Knoxville doctors use heat or cold to fix it"
"And Finally: 9 months later, snow storms bring new life"
"Knoxville preemie twins serve as reminder of Prematurity Awareness Month"
"From Bedside To Boardroom UTMC's First-Ever CMO Creates Hybrid Position To Serve Patients And Doctors"
"A labor of love: Volunteers come together to remove fallen tree that killed Vonore girl"
"Questions grow about safety of e-cigarettes"
Miracle has helped strengthen the UT Graduate School of Medicine's mission for excellence in medical education. As the clinical base year coordinator, Miracle guides and manages Anesthesiology residents who are completing their first year of residency. Three years ago, the Anesthesiology residency program at the UT Graduate School of Medicine grew from a three-year program with residents completing their preliminary year in a Transitional Year program to a four-year program with residents completing their preliminary year in Anesthesiology. Miracle worked with Robert Craft, MD, Anesthesiology, Chair and Program Director, and Kip Robinson, MD, Assistant Professor, to help initiate the clinical base year of the program, and she said she has networked with coordinators nationally to brainstorm ideas. Beyond her work, Miracle is a performance artist with experience as a fire eater and folkloric belly dancer. She often performs on Market Square in Knoxville. Roberts has had a long-standing appointment with the UT Graduate School of Medicine. Playing a major role in research model safety, he works closely with investigators in UT Graduate School of Medicine research laboratories to support their discovery endeavors. 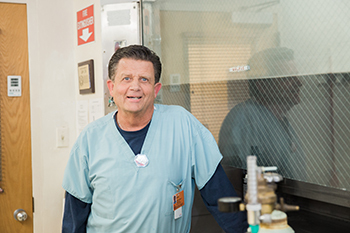 He ensures that research models, including animal models, are maintained properly and available to investigators when needed for clinical studies. He also ensures U.S.D.A. protocols are followed for safety. Roberts said he is continually fascinated by the studies conducted and how they apply to patient care. Beyond his work, Roberts enjoys creating art through woodworking and photography and has even made a leather horse saddle. 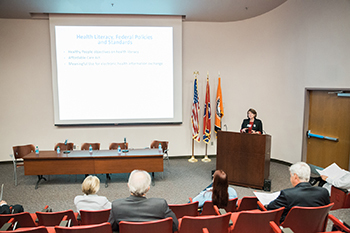 Jennifer Russomanno, Continuing Education and Professional Development coordinator and UT Knoxville graduate student in the UT College of Education, Health and Human Sciences, received the Public Health Education and Health Promotion award from the American Public Health Association (APHA). 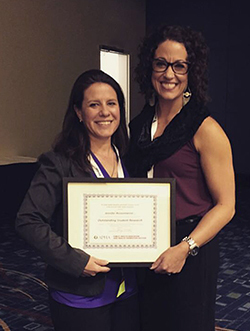 As 1 of only 10 student recipients across the country each year, this award allowed Russomanno to present her research on Farmer's Market Uptake of Food Assistance Programs in East Tennessee at the November APHA meeting in Chicago. 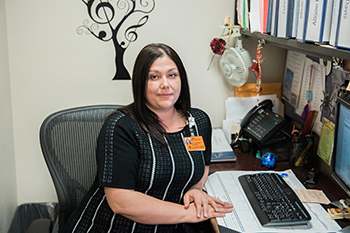 Russomanno is pursuing a master's degree with the Department of Public Health at UT Knoxville. She is featured in the Fall 2015 edition of the magazine, Accolades, as a Student To Watch. Russomanno, who co-owns an organic farm and has discovered how difficult it is for people participating in the Supplemental Nutrition Assistance Program (SNAP) to access fresh and healthy foods, hopes to shed some light on why more small, rural farmers' markets in East Tennessee are not accepting SNAP payments. Read more about Russomanno's research addressing the lack of farmers' markets in East Tennessee that are approved to accept SNAP in Accolades. The Eleventh Annual Diabetes Regional Conference is scheduled for April 2 at UT Conference Center in Knoxville, Tennessee. Register today at www.tennessee.edu/cme/Diabetes2016 for this popular conference. This course will cover topics including new pharmaceutical treatment options for diabetes, obesity and dyslipidemia; the benefits of early diabetes diagnosis and intervention; literature surrounding guidelines for management of dyslipidemia, hypertension and diabetes; and simple diabetes education in the primary care office setting. The conference is presented for medical professionals in family medicine and internal medicine as well as pharmacists, dietitians, endocrinologists and other healthcare professionals involved in the prevention and treatment of diabetes. It is approved for AMA, AAFP, ACPE and CPE credits. The Eleventh Annual Diabetes Regional Conference is presented by the UT Graduate School of Medicine Department of Family Medicine, Knoxville. A reduced registration fee is offered for those who register by March 24, 2016. Registration is now open for the Fourth Annual Medicine Conference: Practice Updates for the Primary Care Physician, a continuing medical education conference set for April 29-30, at the Holiday Inn Knoxville Downtown World's Fair Park, Knoxville, Tennessee. The conference is approved for AMA, AAFP and ACPE credits. Register today. Faced with an aging population, new developments in technology and treatment options, it will be increasingly important for the health care provider to stay up-to-date on the newest developments and trends in the medical community. The Fourth Annual Medicine Conference will address new developments and trends in relevant areas such as new pharmaceutical treatments, hepatitis C, dementia evaluation, and blood pressure control among others. 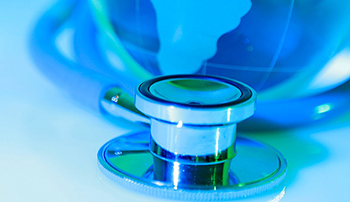 This course is designed for physicians treating primary care patients. Physician assistants, nurse practitioners, nurses and pharmacists are also welcome to participate. It is sponsored by the UT Graduate School of Medicine Department of Medicine. A reduced early-registration fee is available through April 15. Learn more.